While concrete5 version 6 and earlier contained the concept of storage locations, these were relatively simple: you could only ever have a maximum of two storage locations. One was the default storage location (/webroot/files/) and the other was a directory that could exist outside the web root. This was useful if you wanted to have certain files protected and inaccessible through the public website. These files could only be delivered to users via download scripts, which would ensure that they could be accurately checked for permissions and/or custom file passwords. While this was useful for certain situations, it didn't address the need that certain sites had to serve files using a completely different backend than the standard web server. 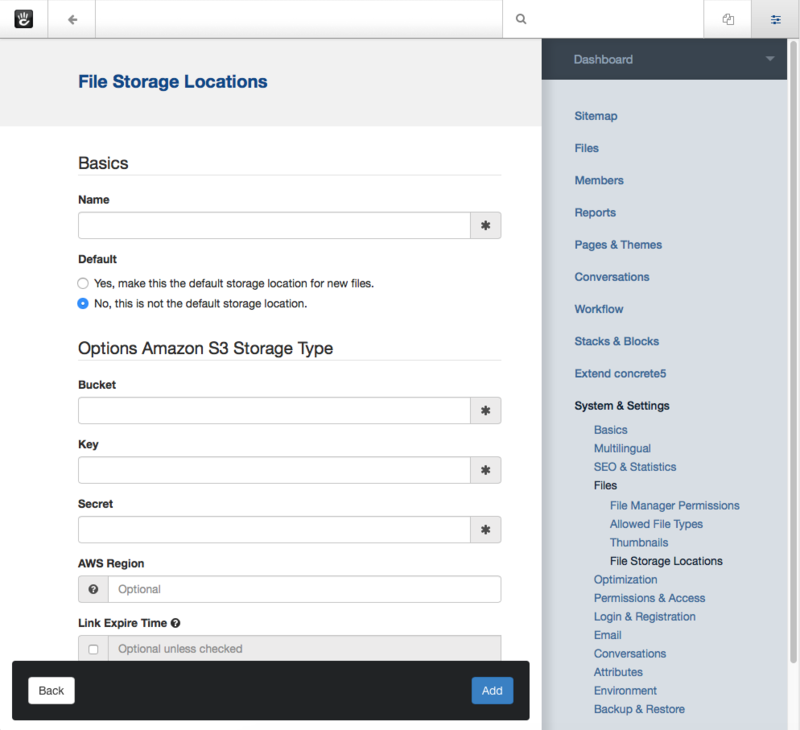 For example, if a site wanted store its file in Amazon S3, there was no easy to do it. In concrete5 version 7, that has changed. File storage locations are now a fully extensible object. 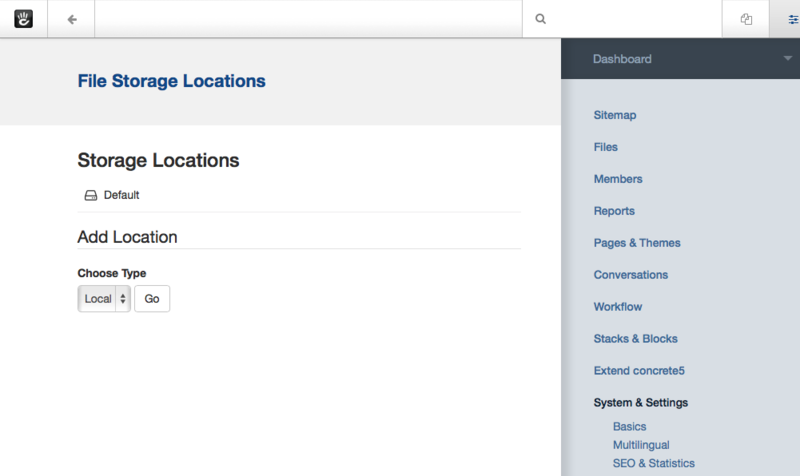 You can define multiple file storage locations in the Dashboard, and their type determines options about them. In these two screenshots, we're showing the list of file storage locations, and adding a new one. The only type of file storage location installed by default is the "Local" file storage location, which is simply a directory on the same server. (Note: this directory can be within the web root, but doesn't have to be.) You add new file storage location functionality to your site by installing new file storage location types, which come bundled in packages. 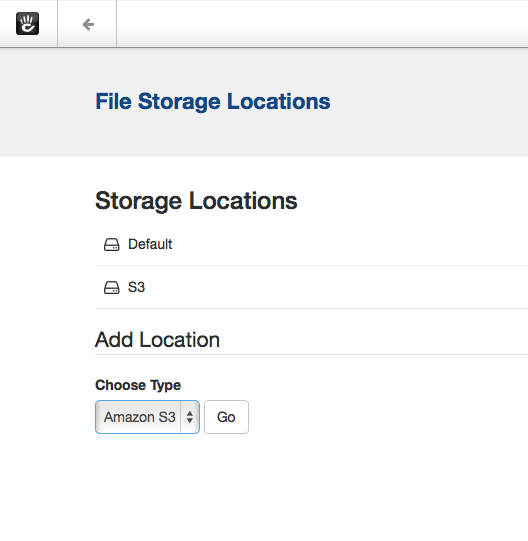 For example, here's what the Amazon S3 File Storage Location type looks like when you add a new location of that type. You choose the type, and then set the relevant options for it. Here's how you can create your own File Storage Location type. (Note: since file storage location types must be installed via a package, you should have an understanding of how packages work before you try this. We'll create a pretty standard package controller for our package. There's nothing special about this package yet. When our custom type is installed, it will be listed in the type dropdown shown in screenshots above. By default, custom file storage location library files are loaded from packages/your_package/src/File/StorageLocation/Configuration/CustomConfiguration, where "Custom" is the StudlyCapsed version of the first parameter in the add() method above. So in our case we'd be loading from packages/custom_storage/src/File/StorageLocation/Configuration/TypeFooConfiguration.php, with a namespace of \Concrete\Package\CustomStorage\Src\File\StorageLocation\Configuration\TypeFooConfiguration.php. However, if we want to remove the \Src from the namespace and make things a little bit nicer, we can add this line of code to our class. Now, our class's name will be Concrete\Package\CustomStorage\File\StorageLocation\Configuration\TypeFooConfiguration.php, and it will load from packages/custom_storage/src/Concrete/File/StorageLocation/TypeFooConfiguration.php. The custom configuration class must extend the base Configuration class above, and it also might implement the ConfigurationInterface. The ConfigurationInterface class takes care of defining methods that any Configuration needs to operate, including how to retrieve public files, get paths to a particular file object, and more. Here is the interface that the custom class will need to implement. Returns true if the configuration has a public URL. Returns true if the configuration has a relative path. These methods take care of handling the POST request from the custom options form used by the file storage location type. validateRequest() should return an instance of the \Concrete\Core\Error\Error object, with or without errors attached. You can use these methods to save your custom file storage options in whatever way you choose. Returns whatever adapter you're using with your custom storage object. This doesn't need to be any particular object, it's just here in order to force you to understand the adapter pattern. Return public URL and relative path to a particular file. $file in this case is always a file path string, not a concrete5 file object. A file storage location will likely need to present custom options to the end user during configuration. 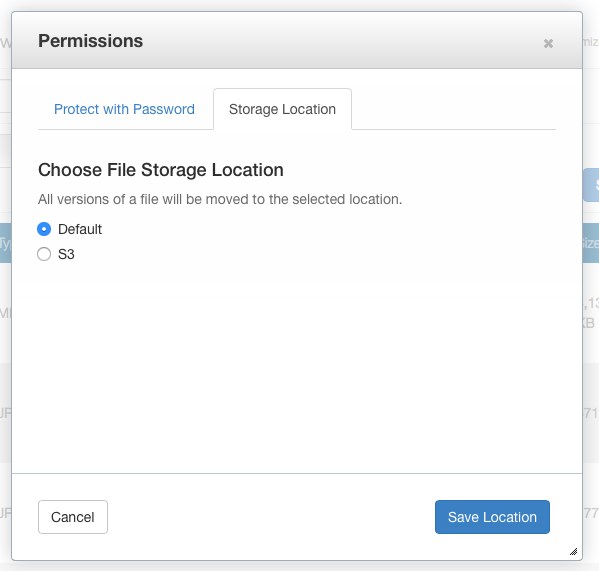 For example, in the screenshots above we can see fields for Amazon-S3-specific options, including API Key and more. To preset custom options to the end user when configuring a file storage location, create a file at packages/your_package/elements/storage_location_types/your_handle.php. So, in this instance, you'd create packages/custom_storage/storage_location_types/type_foo.php. 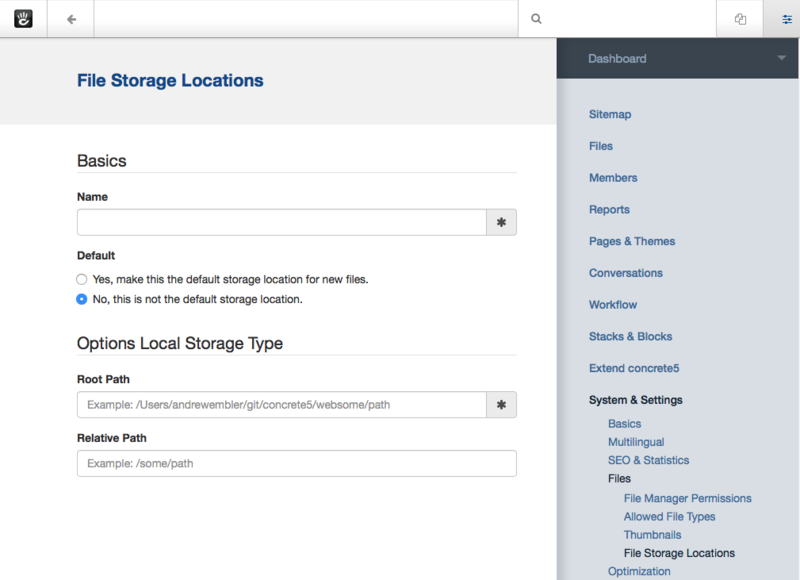 When adding a storage location, the form within this element can be empty. When editing, the element receives a fully configured version of the storage location type via the $configuration object, which is automatically available. In our case the $configuration object would be an instance of the \Concrete\Package\CustomStorage\File\StorageLocation\Configuration\TypeFooConfiguration object. Since this might still be a little opaque, it might be helpful to check out the built in LocalConfiguration object to see how it works. This is the file storage location type that handles delivering files in the local file system.